This beautiful 1956 Studebaker Golden Hawk was restored from "less than a parts car" by Bill Glass of Valhalla, New York. It took Bill six years to restore what he lovingly calls "the Hawk from Hell." The 1956 Golden Hawk was the only Studebaker model to use a Packard engine. This engine displaced 352 cubic inches and was rated at 275 horsepower with standard four barrel carburator and dual exhausts. The combination of a light body and a big engine made the 1956 Golden Hawk was one of the fastest American cars on the market at the time. Bill Glass, who goes by the nickname "Bondo Billy," has a web store that sells a wide variety of Studebaker garments and gifts. Thanks to Bill for sending in this picture of his fine car. 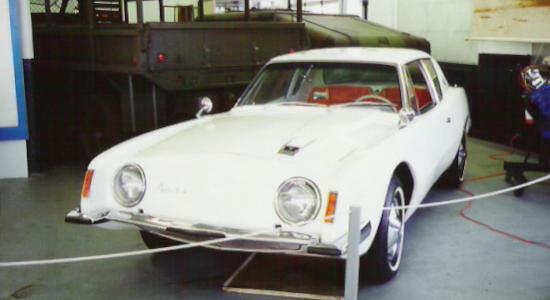 This 1963 Studebaker Avanti is on display at the Studebaker National Museum in South Bend. The Avanti used a fiberglass body supplied by the Molded Fiberglass Company (MFG) of Ashtabula, Ohio. MFG also made the Corvette body for General Motors. The Avanti body was assembled from more than 100 fiberglass pieces. Unlike the Corvette, the Avanti was a 4 passenger car, so the two were not direct competitors. In addition to light weight, the Avanti's fiberglass body does not rust like other Studes. Studebaker produced 4,643 Avantis before production ended in December 1963. When Studebaker shifted production of passenger cars from South Bend to Canada, the Avanti was discontinued as a Studebaker product. South Bend auto dealers Leo Newman and Nate Altman bought the rights to the Avanti and a building in which to assemble it. By 1966 the Avanti was back in limited production with a Chevrolet powertrain. Early Avanti II's look much like the original. This picture shows an everyday driver 1973 Avanti II that is painted Geo Storm blue. There is no "incorrect" color for an Avanti II as any automotive color was available by special order. 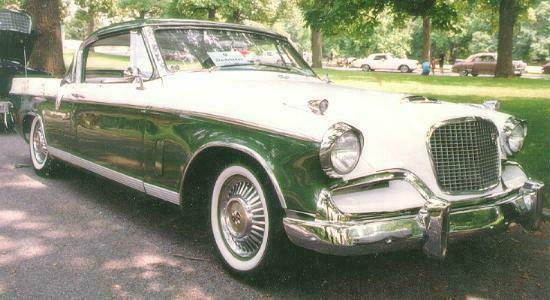 Studebaker added small fins to the Golden Hawk in 1956 and much larger concave fins to the Golden Hawk and Silver Hawk in 1957. Not to be deterred, the owner of this 1955 Studebaker Coupe added very large custom fins to this otherwise stock appearing Stude. The work appears to be professional and the result is quite dramatic. Studebaker removed the fins with the introduction of the Gran Turismo Hawk in 1962. It is not known if the owner of this car followed suit.